Dan Tessoni, the Saunders College of Business’s Forman Chair for Collaboration and an esteemed member of the RIT faculty since 1974, will be honored at a ceremony April 21. Saunders College of Business at Rochester Institute of Technology announces the Daniel D. Tessoni Endowed Chair in Accounting. Tessoni has been an esteemed member of the RIT faculty since 1974. He will be honored at an invitation-only event from 5 to 7 p.m. Tuesday, April 21, at Country Club of Rochester. Tessoni is the Saunders College’s Forman Chair for Collaboration and has been an astute practitioner of the art of accounting in both the classroom and in his role as a practicing CPA. He has served as a board member for several corporations including International Textile Group, Genesee Regional Bank, Western New York Energy LLC, and ACC Corp. According to Tessoni, many accounting graduates from Saunders College are successful alumni who serve in the highest levels of their organizations as presidents, CEOs, CFOs, founders and partners. “My mentoring doesn’t stop in the classroom; I continue to have a relationship with many of my former students,” said Tessoni, a resident of Pittsford. 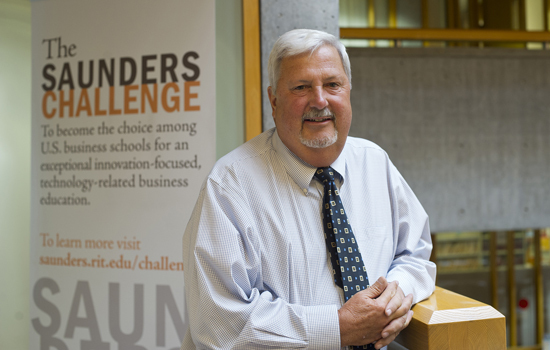 Local business entrepreneur E. Philip Saunders, owner of Saunders Management Co. and benefactor of RIT’s business college that bears his name, provided the lead gift to establish the endowed chair in accounting. Joseph Lobozzo, who earned his Executive MBA degree from RIT in 1995, agrees. The founder and former CEO of JML Optical Industries Inc. said he first met Tessoni soon after Labor Day in 1993. “I was in the very first class of EMBA students at RIT,” Lobozzo recalled. “He came in and gave us an accounting lecture and at the end of nearly four hours, he asked us: What is the goal of any firm? It’s to maximize the wealth of the shareholder—end of story.